The aim of the Network is to provide a forum to focus on supporting and advancing women in the Victorian public sector. 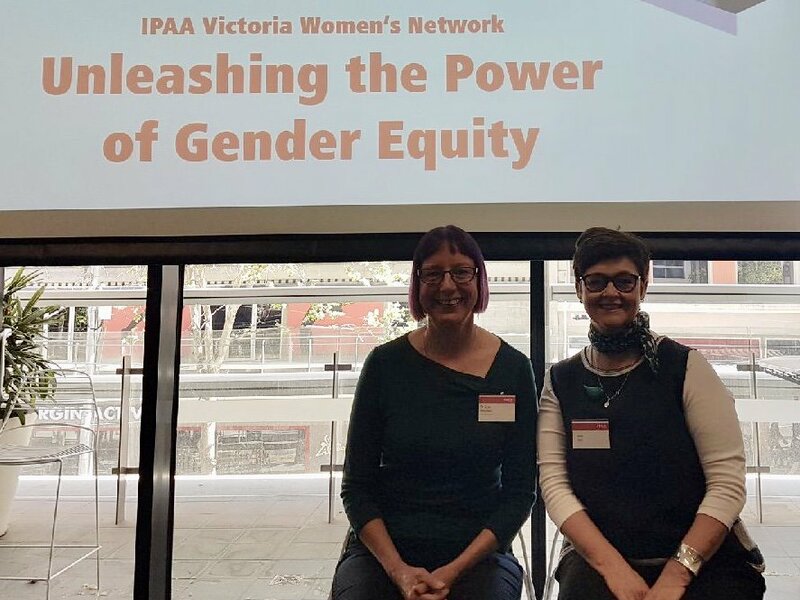 The Network demonstrates IPAA Victoria’s commitment to more broadly supporting and empowering women in the public sector across Victoria and ensuring the sector fully leverages their skills and leadership. Despite tremendous progress in the last decade - and a few standout statistics - women remain significantly under-represented in leadership positions across the public sector in Victoria. Advancing women into leadership presents a strategic opportunity to strengthen our sector. Diverse leadership, which reflects the communities we serve, will maximise the effectiveness, innovation and performance of our sector. There is clear research now available that show the barriers to women’s advancement are predominantly systemic in nature. IPAA Victoria’s Strategic Framework for the Advancement of Women in the Public Sector will allow the sector to plan and monitor strategies in place towards advancing women. It is informed by local and international research into the barriers to women’s advancement into leadership roles together with learnings from IPAA’s many years of activities throughout Australia. Complete a survey to help shape our Women's Network activities for 2019! The Advisory Committee has been established to drive the direction and priorities of the IPAA Victoria Women’s Network. The Committee provides advice and advocacy to the IPAA Victoria Board and to the Victorian Public Sector Commissioner. empowering future generations of public sector leaders through mentoring and developing talented women. The framework identifies four areas of need in advancing women in the public sector, informed by Victorian Public Sector Commission (VPSC) data, local and international research into the barriers to women’s advancement into leadership roles and learnings from IPAA many years of various activities across Australia. Support women in the public sector to connect, network, share, ideas, access information and influence decision making. Identify and address system barriers to women’s advancement in the public sector in Victoria. Develop and support women holding leadership roles in the public sector across Victoria. Build the leadership capacity of women across the public sector. The four strategic opportunities form a spectrum of needs for supporting women’s advancement in the public sector. At one end is a more traditional core service offer around building the leadership capacity of women in the public sector. At the other end is a very active role in advocacy and championing. In between are opportunities around facilitating connections and networks, and supporting current women leaders. IPAA Victoria has adopted the framework to guide our own strategic planning and plan the activities that we will deliver in this field. IPAA Victoria will also use the framework to monitor and advocate for activities and outcomes across the Victorian public sector. A suite of indicators and targets are in development. identify and deliver excellent and accessible events that meet the needs of women across the public sector and strengthen our sector’s service to the Victorian community. Stay tuned for special forums and events, mentoring opportunities, exchange ideas and networking opportunities. Unleashing the Power of Gender Equity with Keynote Speaker, Dr Sue Williamson UNSW and guest speaker, Ms Keryn Negri. It was a chance to learn from actual public sector research that has been conducted here in Australia. The research focuses attention on middle management – a very large and potentially very powerful cohort within the public sector. Dr Sue Williamson is an academic from the School of Business at the University of New South Wales in Canberra – where she is part of their Public Sector Research Group. Sue is one of the four authors of a research report, The Role of Middle Managers in Progressing Gender Equity: A leading practice guide, which analysed interviews with almost 300 managers across four public sector jurisdictions. Her report offers a number of insights into the role that middle managers can play in operationalising gender equality-focused policies. The report can be accessed here - https://www.unsw.adfa.edu.au/public-service-research-group/research-projects/role-middle-managers-progressing-gender-equity-public-sector. Keryn Negri has a 20 year public sector career, she was most recently Chief Executive Officer of the Victorian Civil and Administrative Tribunal. She is also an ANZSOG Fellow and in August 2018 was recognised as one of the Top 50 Public Sector Women presented by IPAA Victoria in partnership with Davidson. Keryn reflected on some of the insights in Sue’s research – particularly drawing on her career as a public sector leader.